Montgomery, Ala. – On Thursday, April 21, 2016, Frank Evans, the CEO of Triton Management Group and employees presented a donation to Lerrick McCovey, senior regional development representative at St. Jude Children’s Research Hospital. 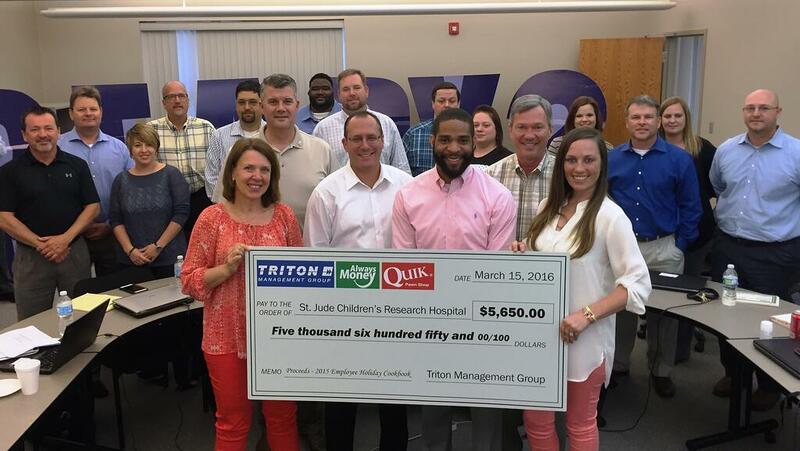 The employees of Triton Management Group voted to donate the proceeds of their company fundraiser to St. Jude to support the ongoing charitable efforts of the nonprofit and their work with children in need. Employees at Triton Management Group worked together over the holidays to create and sell a company cookbook with family recipes. The cookbooks were sold for a $5 donation to charity — the proceeds of which totaled $5,650 and was presented to St. Jude on Thursday. Triton Management Group is comprised of several affiliated operating corporations including Always Money™ and Quik Pawn Shop. Triton operates over 100 locations in Alabama, South Carolina, and Mississippi; and has been a trusted resource in the southeast for over 35 years providing various personal loans, check cashing, and other related services.